A postdoctoral position is the expected next step for many graduate students. If you are interested in an academic career, then a postdoc is definitely a necessary rung on the ladder towards academia. Choosing the right postdoc will then be one of the most important decisions for your career and you will need to think about it carefully and with advance time before making the switch. If you are still not sure about your career goals, then a postdoc might afford you additional time to make a decision, but this can come at a cost of time and salary. For these reasons, it is important to inform yourself as soon as possible about what it means to do a postdoc and what to consider when searching for one. During the second installation of Conversations with Scientists, fellows from the Yale Ciencia Academy for Career Development (YCA) talked with a panel of early-career scientists with recent experience with the postdoc decision and search. Dr. Kaliris Salas-Ramírez, Assistant Medical Professor at City University of New York (CUNY), Hunter College, where she works to understand how drugs of abuse impact the developing brain. The panel was moderated by Dr. Mónica I. Feliú-Mójer (YCA Program Coordinator) and Dr. Giovanna Guerrero-Medina (YCA Principal Investigator). The YCA 2016 Fellows had lively and informative “real talk” with our panelists. They talked about how to determine whether a postdoc is the next step; what should you consider when selecting a postdoc; and how to negotiate a postdoctoral position. The main goal of this conversation was to inspire graduate students to reflect on their next steps, consider if a postdoc would help them with their career goals, and begin preparing for that transition to be as successful as possible. What’s the purpose of the postdoctoral position? Most panelists agreed that the main reason to do a postdoc is to have dedicated time to gain the skills, connections, techniques, experiences, and confidence that can sustain the beginnings of an academic career or at least a career as an independent researcher. Below is the official definition of a postdoctoral position, placing (humorous) emphasis on the fact that it should be a temporary position for gaining experience. The majority of the panelists agreed that for their postdocs they had decided to work in an area that would give them new tools to dig deeper into the research questions that fascinated them. As an example, Paola had had previous experience in cellular and molecular neuroscience but she wanted to be able to work in complex mental health disorders. For this reason, she chose to do her postdoc in a lab that focuses on human populations and that uses genomics and biostatistics as tools to explore the causes of psychiatric disease. In this way, Paola is using her postdoc to gain new tools for her research arsenal. Kaliris explained that a postdoc is also a great opportunity to gain more advanced professional skills that will be important in academia. Postdoctoral milestones might include writing grants, managing a budget, managing staff, managing projects and collaborations, taking the lead in writing papers, etc. Make sure you are clear with your Principal Investigator (PI) about your intention to gain these types of experiences. How do you look for and secure a postdoc? Do not wait for an ad to come out. Networking, networking, networking and using your connections are the best ways of finding the postdoc you want. Approaching PIs at conferences “is critical” for face-to-face interactions: invite people to your poster or your talk. If possible, ask your graduate school PI to make introductions. If that’s not an option, Paola advised emailing directly the PIs of laboratories you are interested in but use a “hook” or a personal connection to make sure they open the email (e.g. mention your current research lab in the subject line). Another strategy is to look for departments that have NIH postdoctoral training grants (T32s), which not only provide funding but also training resources. Regardless of the strategy, make sure you write a professional letter of introduction describing what you can bring in to the lab. What should the postdoc interview process be liked? How long should a postdoc be? Should you do more than one postdoc? According to the panelists, it depends on the research field but in general, three years is the minimum. Animal and human research can take 5-6 years, so if you are going to be undertaking this type of postdoctoral position, you should be prepared to stay for a longer amount of time. Alberto shared that he did two postdocs. He went into a second postdoc with the clear goal of gaining new research skills and to publish in more high-profile journals. In his case, this calculated decision worked out for the best. In the end, be clear about what your goals are and be proactive about following your own plan. Fellowships – Which ones, when, and why should you apply? What happens if you need to take a break in your research training? How do you explain it? What types of considerations should go into determining the research area for your postdoc? Clinical research: are postdocs required? 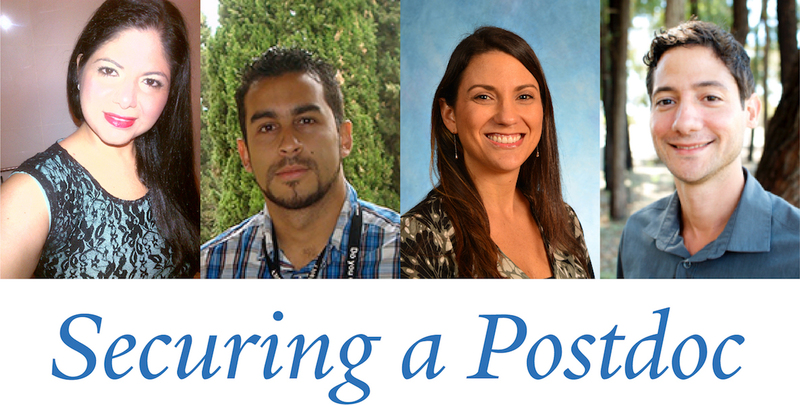 Industry postdocs: how is your graduate student experience evaluated for these positions? The importance of developing people skills and how a postdoc can help with this. How do you know when you’re ready to make the transition from postdoc to faculty? What to do if you suddenly find yourself in a bad postdoc? Final thoughts: Postdocs are fun! Minority Postdoc - Website with resources and advice for postdocs. An excellent resource for those postdocs who are embarking on the job hunt for positions within or outside of academia. National Postdoctoral Association Graduate Student Resource for Choosing a Postdoc – Tools and guides to help graduate students apply and interview for a postdoc, choose the right postdoc, and establish their own niche to secure independence. Moving On: Managing Career Transitions – This book by the Burroughs Wellcome Fund offers practical advice on when to recognize it’s time to take the next step in advancing your career in research, whether it’s a postdoc, a teaching position or an academic position. Science Careers Postdoc Collection - Over the years, Science Careers has explored many questions related to the postdoc experience and offered advice on how best to tackle them. Here is a roundup. 11 things you should look for in a postdoc position – Great advice on how to evaluate and compare postdoc offers. List of all current institutional training grants (T32s) – You can search this list by institution, location, and for programs that host postdocs. Research Supplements to Promote Diversity in Health-Related Research – If you are interested in working in the lab of someone with R01 funding, you could mention this as a mechanism to support or complement your postdoctoral training. This mechanism is frequently underused at the NIH. Institutional postdoctoral fellowships to promote diversity – Some universities have started programs that fund semi-independent postdoctoral positions with a focus on diversity. Institutional Research and Academic Career Development Awards (IRACDA) – A NIH-program that combines a traditional mentored postdoctoral research experience with an opportunity to develop academic skills, including teaching, through workshops and mentored teaching assignments at a partner institution.